What Are the Benefits of Product Flow Alignment? Do you consider the total cost of ownership and ensure that your workers are competent and aligned to the product flow instead of by function? Your span of control is simply the number of employees that report to you directly. Competent workers should have little need for managers to guide them. So, span of control is inversely proportional to subordinate competence, trust and layers of management. Do you know what it means to be aligned by product flow? By increasing the number of employees each manager supervises, an organization “flattens”, allowing productivity to increase. But, to realize this productivity increase, you will need to consider the total cost of ownership and ensure that your workers are competent through training and aligned to the product flow instead of by function. Today, most organizations are aligned by function. Departments like Sales & Marketing, purchasing, or production are created to achieve economies of scale and specialization by tasks. Badly needed cross-functional teams are rare. Instead, departments seek to sub-optimize their areas by focusing on their own goals. The result from this lack of diversity is a slow changing organization with a slow Idea Adoption Cycle. 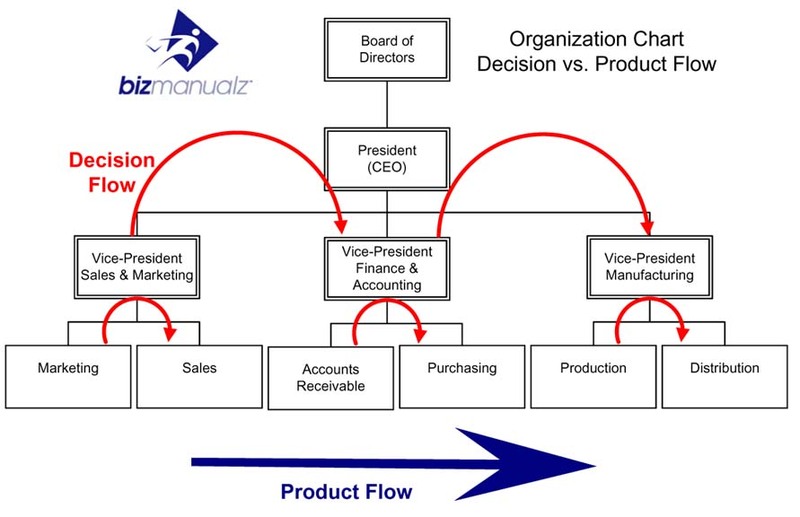 What is truly crazy is that these functions are organized to deliver products to customers yet the organizational layout is perpendicular – 90 degrees – to product flow (see figure). 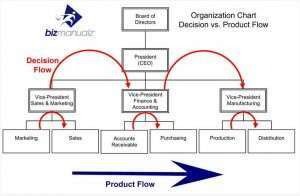 The red arrows show the decision flow constantly moving up and down the org chart, while the horizontal blue arrow shows the product flow. If product decisions moved along the product flow line then there would only be five decision points. Instead, most organizations force decisions to flow up and down across the same five product flow points plus the three Vice-President points plus the one CEO point for a total of 10 decision points. Not only does this add delays by doubling the decisions needed but it also adds four management points to the decision flow. Why does management need to be involved? 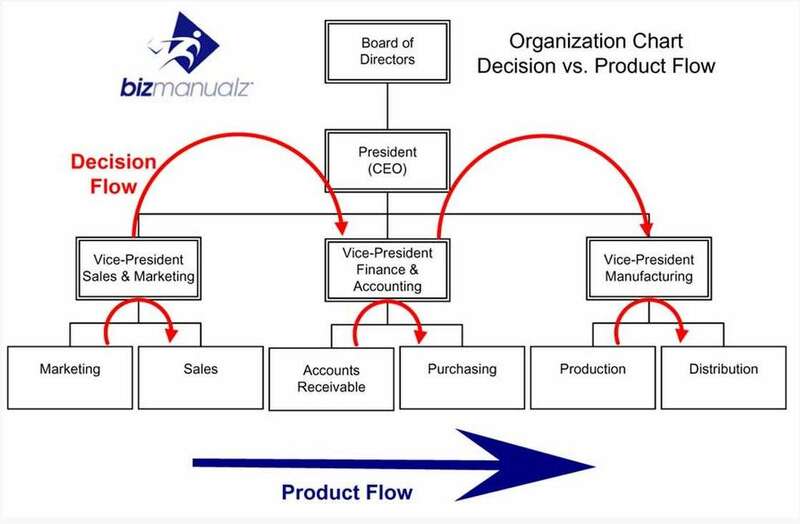 Does this typical org chart exhibit Lean Thinking, optimized to deliver products quickly and at the lowest cost? Try it at your organization. Just trace the product flow of your order-to-delivery cycle and see how many decision points, departmental boundaries, or delays you have. You will be amazed at the result. The real focus that is needed is systemic, on the whole organization, and not a sub-optimized departmental view of individual budgets, goals or priorities. After all, the customer does not care about your organizational structure. The customer just wants the finished good or service at the lowest possible price that you can deliver it. This is the total cost of ownership or the sum of all costs required to bring the product to market. For example, if purchasing saves a dollar by buying cheaper raw materials, yet technical support spends an extra dollar because of the cheaper raw materials used then there was no savings to the customer. Yet, purchasing achieved their goal, saved money, and came in under budget. Technical support on the other hand failed to achieve their budget goal and went over by one dollar. One department wins and one loses. Technical support is getting the short end while the purchasing manager gets promoted. Why not just align the decision flow with the product flow by creating a product flow team with one representative from each area? You would eliminate management from the product flow, reduce the number of decision steps, and align your workers with your customers. Isn’t this what we want? Of course, you would also be increasing your span of control, but so what. The Japanese regularly operate with much larger spans of control and have proven that the system operates more efficiently. The change management solution is not an improvement in employee motivation, performance incentives, and goals, or just eliminating layers of management, for the problem is systemic. Management did not create the dysfunctional organization. The process was incremental, evolving all along but unnoticed. Your Organizational chart is an outgrowth of many decisions distributed over time, of well-intentioned managers and staff responding to growth and changes in the market within an organization that favored hierarchy, risk-aversion, and consensus decision-making. Companies evolve, aligning by department or function instead of by product flow to save money, and they never seam to stop to look at the Total Cost of Ownership. Yet by looking at the systemic nature of the organization we can use tools like Lean Thinking to eliminate some of the organizational dysfunction to align the organization with the product-flow.